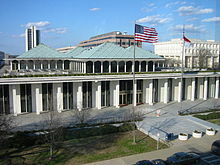 Monday is upon is, the beginning of what is likely to be the penultimate week of the General Assembly’s 2012 short session. This post provides an update on where those two bills stand, and also reports on a third construction-related bill that hit my radar last week. Proposed language to N.C. Gen. Stat. § 44A-7 that would have provided lien protection for suppliers of non-commodity prefabricated materials when those materials are not delivered to the job site has been removed from the legislation. Representative Paul Stam sponsored the amendment on the ground that the lien law should only protect improvements to real property, not fabrication of goods that are never sent to the site of the improvement. The original bill would have limited recovery under a payment bond to amounts due for work or materials provided within 60 days before the claimant provided formal notice of its involvement on the project; that threshold has been increased to 75 days. The original bill would have exempted claims of $10,000 or less from the new notice requirements; that threshold has been increased to $20,000. The substitute bill can be found here. (2) The “hidden lien” bill remains in House Judiciary Subcommittee B. During last Wednesday’s meeting, House staff attorney Bill Patterson listed about ten concerns that various stakeholders have expressed to him about the legislation. That list included many of the concerns expressed in my prior post, including which parties should be responsible for providing lien agent information down the contractual chain, the potential impact of the legislation on late-performing trades and whether the legislation should be applied only to residential projects. Representative Stam strongly urged all industry stakeholders (at least 25-30 of us were present) to get together, try to iron out the differences and bring the Subcommittee a consensus bill ASAP. To the best of my knowledge, neither a stakeholder meeting nor another Judiciary Subcommittee meeting has yet to be scheduled. (3) A local bill allowing Union County to enter into build-to-suit capital leases with private developers for the construction of law enforcement and human services facilities has passed the Senate and is awaiting approval in the House. The bill can be found here. Not only would the legislation allow Union County to opt out of hard-bidding for certain construction projects, it would also permit a letter of credit (“LOC”) to substitute for statutory performance and payment bonds on these project. That might be of potential concern to the subcontractors and suppliers who ultimately furnish the labor and material for these build-to-suit capital lease projects. That’s because only the holder of the LOC — i.e., Union County — could make a claim on the instrument. Effectively, that means if a payment dispute arises on a project, Union County would have no choice but to involve itself in the resolution of the issue to determine whether or not it needed to make a claim on the LOC. It’s not difficult to envision a scenario whereby this process delays the payment cycle. Kudos to the Surety & Fidelity of Association of America (“SFAA”) for bringing the issue to the fore. While it could be argued that SFAA is just trying to protect its constituent companies in opposing this legislation, my sense is that the organization has articulated a valid concern that subcontractor and supplier groups should consider addressing as the legislation works its way through the House. Ready to update your article? The bill passed both House and Senate but needed some revision. The revision came out quickly today in a joint conference report. The final version should be going to the Governor no later than June 29. Thanks for the update, Rep. Stevens! I’ve been listening to the Senate floor proceedings over the Internet this afternoon, and was excited with the passage of HB 1052 as amended. I hope to release a blog post with the details later this evening. Thank you so much for your ongoing efforts with respect to this important legislation.